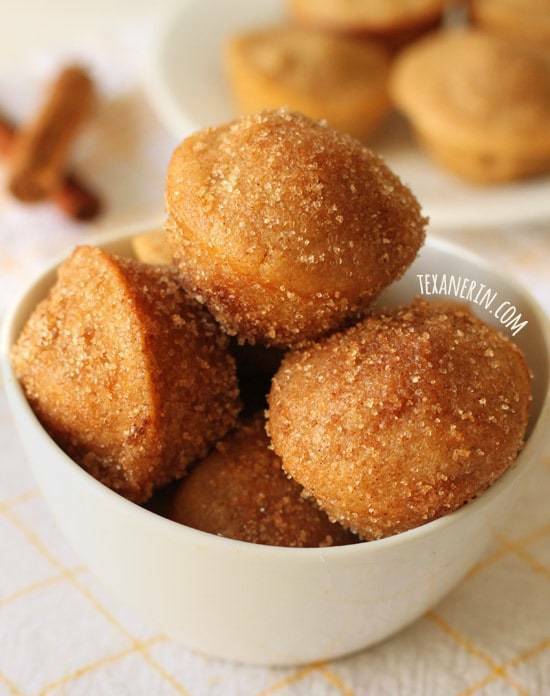 April 10, 2014 by: Erin D.
My sweet new friend, Erin from Texanerin Baking is here today with a recipe for simple and delicious Cinnamon Sugar Donut Muffins. Don’t let the “healthy” ingredients fool you… Erin has come up with a recipe that is so sinfully amazing! Thanks, Erin for helping out today! To see more of Erin’s healthier dessert options, check out her blog, Texanerin Baking! Hi everyone! I’m Erin and blog over at Texanerin Baking, which is all about making healthier baked goods that taste just as decandent and amazing as their unhealthy counterparts! I do about half whole wheat goodies and the other half is usually grain-free. I don’t have any dietary issues – I just happen to love almond flour and so my goodies coincidentally come out grain-free and gluten-free. I realize most people don’t have almond flour at home so today I made something 100% whole grain for you! I really recommend using white whole wheat in these. It’s got all the nutrition of regular whole wheat flour but doesn’t have that cardboardy whole grain taste. The whole grain taste is usually easy to cover up with cocoa powder, spices and other strong flavors, but here we just have a little cinnamon, which isn’t enough to be victorious over regular whole wheat. 😉 If you don’t have white whole wheat, you can totally use all-purpose flour. 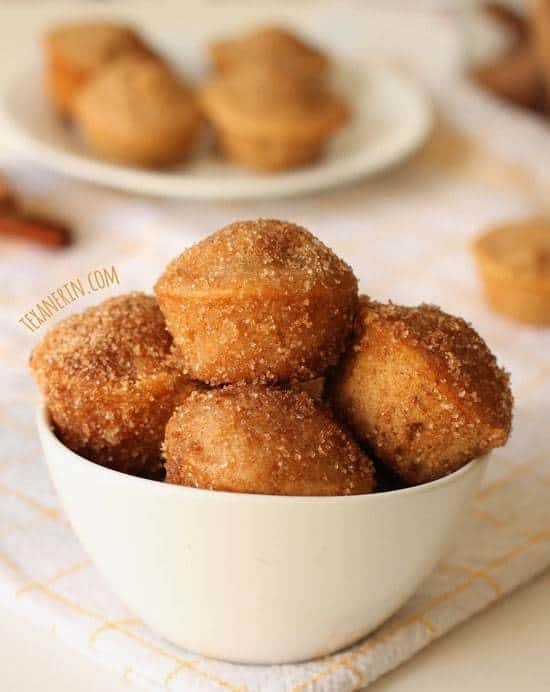 I rarely bake vegan, just because I really love using eggs in baking, but sometimes you just need a cinnamon sugar donut muffin and so you have to find a vegan recipe. But any vegan recipe won’t do for me – it needs to taste exactly like a egg-laden, butter-filled version (like these peanut butter chocolate chip macaroons!) and these vegan cinnamon sugar doughnut muffins from Baker By Nature fit the bill! They’re soft, fluffy, moist and completely funkiness-free. So I made these muffins, and I guess I was so ecstatic at how they came out that I wasn’t thinking about the vegan thing and dipped them in butter. Whoops. So these aren’t actually vegan anymore! If you need a vegan version, dip them in melted coconut oil or just sprinkle the cinnamon sugar on top of the muffins before baking. I hope you enjoy the muffins and if you ever have a hankering for some healthier sweets, I’d love to have you come over and visit me on Texanerin Baking! Preheat the oven to 400F and grease a mini muffin tin. Add the dry mix to the wet and stir just until combined! Over-stirring will result in tough muffins. Fill the liners almost completely full and bake for 6-8 minutes or until a toothpick inserted in the center of a muffin comes out clean. While the muffins are baking, mix together the sugar and cinnamon in a small bowl. Immediately turn the muffins out onto a wire rack and dip each muffin in the melted butter and then roll in the cinnamon sugar. Place on the wire rack to cool completely. Serve immediately and refrigerate any leftovers in an airtight container for up to 5 days. Nice to see you here, Erin! Vegan, non-vegan…whatever. I love anything with cinnamon. It’s my kyrptonite. Want! These look so delicious! I would probably sit down and them all. I cannot be trusted around mini desserts…haha. Oh yummy! I’ll have to try these!! OMGOSH!!! 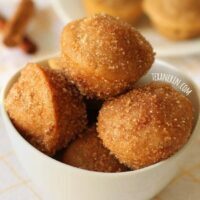 I just made these, took them out of the oven, rolled them in the cinnamon sugar combo and ate 4!!! Fantastic recipe!!! LOVE LOVE LOVE the white whole wheat flour and applesauce! I only dipped the tops in the melted butter and cinnamon sugar. DELISH!!! Thanks for sharing. I’m so thrilled that Erin’s recipe turned out so great for you!! 🙂 YAYA! Hi! Do these freeze well?? Yes, they do! After freezing, defrost in the fridge overnight, and your breakfast will be ready for you in the morning. 🙂 Or just thaw on the countertop. It won’t take very long! What kind of non-dairy milk can be used to make these truly vegan? I’m no sure Sandi, I don’t do a lot of vegan baking and this recipe was submitted by Texanerin Baking. Have you done any baking with any vegan milk before? I’d try subbing whatever you’ve used in the past for the milk in the recipe. Let me know how it turns out for you! 🙂 Happy Baking! Any type of non-dairy milk can be used. Almond milk, soy milk, oat milk… whatever you have on hand! No problem! And sorry I was a little slow. Hopefully she got her answer in time! I just found this recipe. I have been craving something like a cinnamon donut. Have you ever made these with a gluten free flour mix? If so is it 1-1 for the flours in your recipe? They just came out of the oven. I used Namaste Foods GF Flour. Fabulosos, Deliciosos! I made them 3 times! Wonderful! So glad you like this recipe! Loved them. They would be amazing with apple cider, but they were perfect with a cup of tea as well. I don’t have mini muffin tins so I used a donut tray and made a few regular sized muffins with the extra batter. Mmmmm dunking in cider would be divine!! Thanks for the feedback, Alecia! Hi! I LOVE this recipe and I make it all the time, usually double. I was just wondering if you’ve ever made this as a cake? I’m not sure if that would work and I’d love your opinion! Nope, never made it as a cake. Try it and let me know how it turns out!! 🙂 Happy Baking! I am making these to take to a meeting and I’d hate them to be cold. What if I left them on the counter overnight like a regular muffin?? Its was super ! I did not roll in the cinnamon sugar. I put blueberry in the mussfins. Its took 20 min to cook but after 15 minutes I put aluminum foil because the muffins turned brownish color I was scared the muffins burn, i I let cooking 5 min more or until toothpick inserted in the center of a muffin comes out clean. its a delicous muffins moist and crispy around the muffins ! pephap dont need to put aluminum foil then i think the muffins will be a little more crispy (hopely not burn need to check) and brown crispy result. This was a success ! And you can make this in version vegan if you want. For the milk i use plain soy milk ( not the unsweetened soy milk. For applesauce was ordinary not unsweetened.